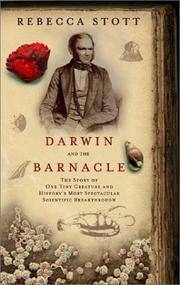 A key period in Charles Darwin’s career: the years 1846–54, when he became the world's expert on barnacles. By the 1830s, Stott (History & Philosophy of Science/Cambridge) points out, sea creatures had become the focus of many naturalists’ efforts. In medical school, Darwin was greatly influenced by Robert Grant, an enthusiastic student of sponges who taught him the rudiments of dissection. Later, on the Beagle, Darwin became aware of the many species of barnacles that inhabit the oceans, including one he found off the coast of Chile and jokingly called “Mr. Arthrobalanus,” because it did not fit into any recognized classification. Back in England, Darwin married his cousin Emma Wedgwood, and settled in Kent to raise a family and begin work on The Origin of Species. He drafted a 231-page version in 1844 only to set it aside, believing he needed to establish himself as a researcher before his theory could stand on its own. Barnacles, in their worldwide distribution and remarkable variety, offered an ideal subject. The project, which he at first thought to complete in five years, eventually occupied him for eight. During those years, Emma bore five children, and his older daughter Annie died at the age of ten. Darwin’s own health became precarious, and he underwent the popular “water cure” in an attempt to recover his energy for work. Stott adroitly covers the events of the day, books, fads, and the gossip on everyone’s lips. But she focuses on Darwin’s growing career, as he corresponded and traded specimens with scientists around the world, making allies and cementing his reputation as the leading authority on barnacles. By 1854, with the four volumes of his barnacle book in print, he was ready at last to set forth on the perilous seas of evolution. Well written and richly detailed.